With the summer just around the corner and healthy lunches and salads becoming very popular, there is usually a lot of prep work in making them. Lots of salad and veg to cut up and skin, well this little gadget makes it super quick and easy. 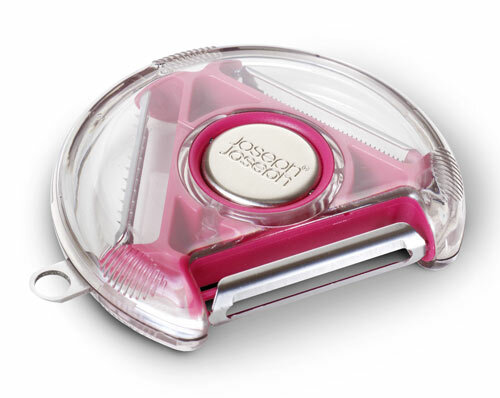 Introducing the Joseph Joseph 3-in-1 Design Rotary Peeler. Design and created by popular kitchen gadget brand Joseph Joseph, this little contraption is designed to easily peel and skin whatever fruit and veg you want like you would with any other normal peeler. This 2 in 1 Rotary Peeler will just cut through the skin, ensuring it perseveres as much of the main vegetable or fruit as possible, reducing waste saving as much as possible. There are three stainless steel blades that you can pick from by simply adjusting the dial along the edge. There is a single standard blade for carrots and potatoes, a Julienne blade ideal for your celery and apples, and a soft-skin one for tomatoes and pears. Of course, they will all work other fruits and vegetables too. 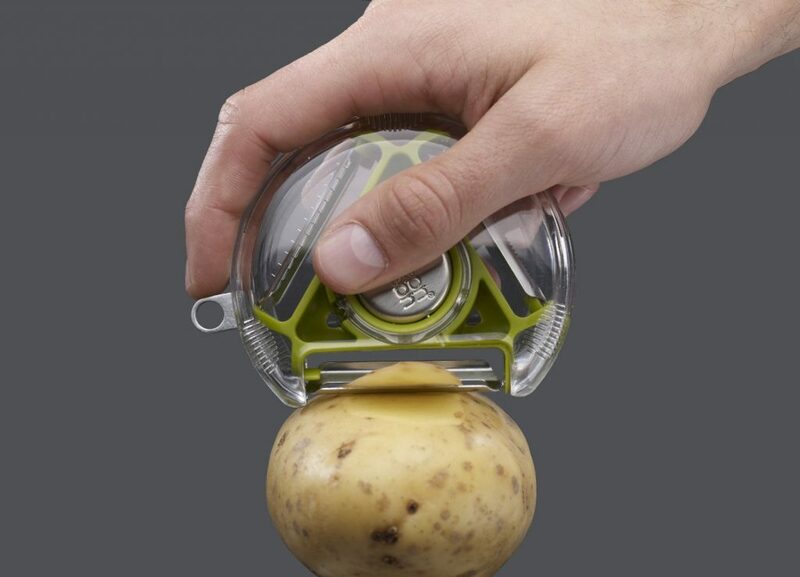 On the side you will also find a stainless steel eye remover for your potatoes too. Joseph Joseph say that this little kitchen tool is ideal for both left and right handed vegetable gutters. As well as being a great little peeler to keep in the drawer it is also quick and easy to clean, simply unclip the case and you can then wash the 3 blades, just be careful, they are very sharpe! This little item can also be washed in a dishwasher. This can be bought in 3 colours, the well known Joseph Joseph green, a pink version or a grey one. At under $10 this is a great gadget and a well priced peeler from the popular brand Joseph Joseph.